Photo by Kara Estabrook Foreground to background Courtney Moran, of Earth Law LLC, Pete Gendron, Oregon Sungrown president, along with Oregon Sungrown members Lorinda Olsen, Lorianne Carey and Jared Watters meet April 25 to talk about Oregon’s cannabis industry. 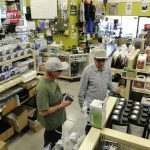 Andy Atkinson / Mail Tribune Jamin Giersbach, right, helps a customer inside Rogue Farmers hydroponic store in Talent. 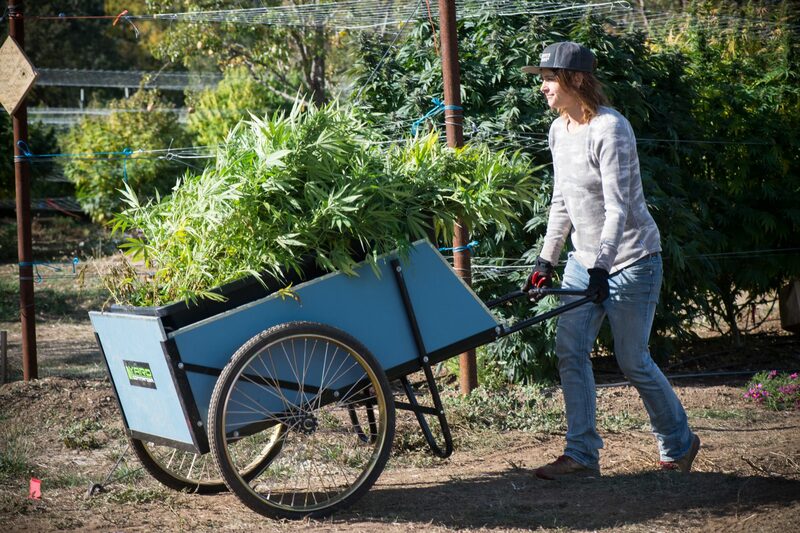 To say that cannabis farming is growing in Southern Oregon would be a gross understatement. As of Aug. 29, 666 marijuana license applications had been submitted in Jackson County — second only to Multnomah County’s 682 — with 477 in Josephine County. When it comes to growers, Southern Oregon was running away from the pack — 474 growing applications were filed in Jackson County and 400 in Josephine. Clackamas County was third with 334. In fact, a large and growing number of working adults in Oregon make their living from the plant in some way, either directly or indirectly. As of Aug. 29, the Oregon Liquor Control Commission reported more than 53,000 marijuana worker permit applications had been submitted statewide since 2016. With any new industry, especially one that’s expanding so fast, there are bound to be growing pains. Talk to growers in the area and they’ll tell you they can’t sell their product in Southern Oregon because there is just too much flower. So their product heads north to Portland and the surrounding areas. 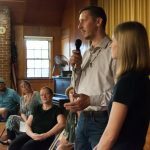 Giersbach, who holds four OLCC licenses in the area with his wife, Melissa, including for Essence Farm in Applegate Valley and Rogue Farmers, a hydroponic garden store in Talent, says there is a great deal of tension between medical and recreational growers — which is understandable. When prices fell hard last fall, it made people hesitate, Giersbach says. Owning a grow store allows him to witness how farmers have been navigating the competition and uncertainty. Many medical farmers are changing with the times, because they have to in order to make a living. “We’re anticipating 30 to 50 percent of our members will be OLCC participants by the end of 2018,” says “Pioneer” Pete Gendron, president of the Oregon Sungrowers Guild, with core membership in Oregon’s “green belt” of Jackson and Josephine counties and roots in helping to strengthen the relationships between medical patients and growers, while advocating for the medical program at the state level. “We’ve included a much more inclusive membership structure to respect our medicine and historical members that still need representation. This has been a much maligned and underrepresented community, and we seek to refine that injustice,” says Gendron, who says he plans to run for Josephine county commissioner. 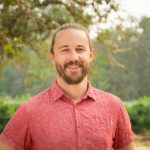 For Adam Smith, founder and executive director of the Craft Cannabis Alliance, the issue is about keeping the money generated by Oregon’s cannabis industry here in Oregon. Still, that’s not the biggest problem, according to Smith. He says the inability to sell outside the state leaves growers stuck with a tiny market. “Growers in Oregon, many of them world-class, are facing an existential threat in the oversupply crisis,” Smith says, adding that if it continues, the state is likely to lose the majority of its locally owned industry. Smith is optimistic that this is a time when those who have stakes in the industry can come together and determine how they want to move forward. His organization, for example, is launching a PR campaign aimed at helping consumers easily identify locally grown craft cannabis. Growers have an opportunity to participate by becoming members of the organization. Kristine Miller, co-owner and grower at Moon Shine Gardens, a recreational cannabis garden on the outskirts of Grants Pass, says she sees the local growing community coming together. 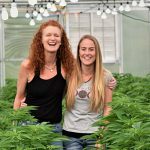 Her farm, which was focused on legal adult use from its start in 2016, grew 3,100 pounds in its first year. Last year, it harvested close to 4,000 pounds. She recognizes the importance of hiring her team locally and paying them a living wage as well as choosing to build community with other farmers, rather than being competitive. “I’ve grown up and worked with really great farmers who have helped each other out, but cannabis farmers have been really secretive about growing practices and what nutrients are being used in their spring schedule,” Miller says. “I do feel like the community of local farms is coming together, because there are people with more resources coming in. People are desperate, the market is scary, and it’s really expensive to start a farm. There are a lot of outside investors that are buying into or buying their companies, and in Southern Oregon we are going to be in the minority when it comes to locally owned and locally employed,” she says. Jessica McClain, the farm’s office manager, agrees. “You can choose to be secretive and competitive or you can choose to band together and set the market standard, like pricing and quality,” she says. You can follow Liz Gold on Twitter/Instagram @lizstacygold or read her blog at www.14karatliving.com.